"At a time when most writings on Christianity and Politics either regurgitate secular fears about theocracy or are simplistic Bible quoting, Brian Stiller has given us a book that is thoughtful, literate, clear, systematic and practical. Jesus and Caesar: Christians in the Public Square is required reading for Christians and others around the world as we struggle to live justly with our differences." --Paul Marshall, Senior Fellow at Freedom House Center for Religious Freedom, Washington DC. "Brian Stiller is one of the most original, important and challenging thinkers in Canada, both in the faith community and outside it. This book confirms that fact, and is essential reading for anybody who cares about the culture, the public debate and the country." --Michael Coren, Radio/TV host and author. 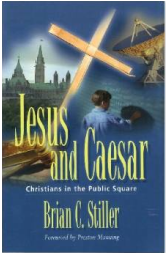 "Brian Stiller's Jesus and Caesar is important reading for everyone with a Christian world view." --Hon. David Kilgour, Member of Parliament for Edmonton Southeast and Secretary of State (Asio-Pacific). "This brief volume should be read by all thoughtful citizens, Christians as well as non-Christians, and particularly by all who hold public office or who proclaim biblical ethics in preaching or teaching. For anyone who needs help in understanding our increasingly secular political environment, and guidance in how to respond to it, this is the book to get." --John H. Redekop, Professor Emeritus, Wilfrid Laurier University; Professor of Political Schience, Trinity Western University. All too often the church vacillates between secularization and sectarianism, between a diminished belief in God in the world and the withdrawal of the church from culture to protect the faithful. Brian Stiller wants to rehabilitate the role of public engagement in Jesus and Caesar to argue that Christians need to steer a middle course between secularization and sectarianism if the church is to be a spiritual light to the world.